On occasion when hiking our 30 acres, which has minimal forest cover, I like to walk back along the narrow strip of mature forest that borders our western fenceline. For most of its length it’s only half a dozen meters/yards wide, although there are a handful of spots where it reaches out into the meadows. I wander through, looking for anything different going on there than I might see in the field a short distance away. I stick to our side of the fence even though it’s an old split-rail that would be easy to hop, primarily because we aren’t sure who owns that land and I feel uncomfortable trespassing unless I know the owners never visit the property. But there’s one spot where our section narrows and has become choked with the invasive prickly ash. If you’ve never had the opportunity to try crossing a prickly ash thicket, it’s rather like trying to push your way through a rose hedge. Yeah. So I hop the fence there and just skirt around the small patch of prickly ash, and hop back and carry on my merry way. Today as I was doing my brief bit of trespassing I happened across this fragment of bone. Picking it up, I noticed it had the round knobs at the back which are the bit of the skull that articulates with the spine. But this clearly wasn’t a complete skull – the front half was missing. Sheared clean off, in fact. I puzzled over it, took a few photos, and left it where it was. What had it belonged to? What had sheared it away? Could a predator slice bone that cleanly? 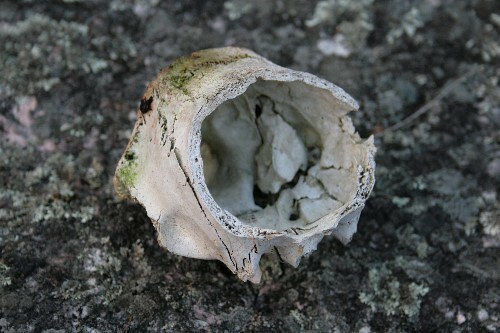 It was only after I returned home that I had the thought that this might be a deer skull that a hunter cut. It was about the right size for the upper half of a deer skull, and comparing it to images on the web, it seemed to have a similar rear profile. I knew that deer antler trophies are sometimes mounted still attached to the poll of the skull. Further investigation (including this instructional video on how to prepare your own such mount, start to finish from a fresh deer head… not for the squeamish) revealed that the skull is cut with a hacksaw in a wedge behind and in front of the antlers, which pretty much confirmed for me what this bone seemed to indicate. Rather than just sever the poll, though, it appears our local hunter cut the back of the skull off first, and then removed the antlers second. Although we’ve never met the folks who own that property, we’ve heard them out on their ATVs on rare occasion, and a couple of weeks ago I heard gunshots from that direction. 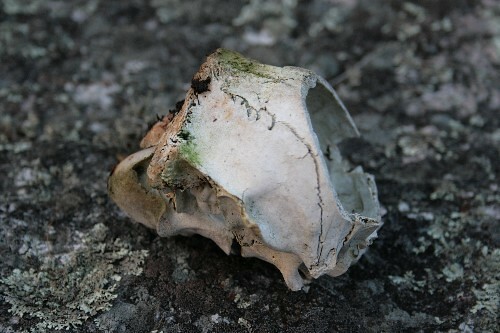 This skull is much too old to have been this year’s, weathered and green with algae as it is, but it’s undoubtedly the remains of one of their kills. I’ve been through that area several times since last year’s hunting season, and as the fragment was lying out in the middle of a rocky bit, it’s unlikely I’d simply missed it before. Which presents another mystery: how’d this old bit of bone get there? It seems much too old for anything to have interest in chewing on it for the marrow. I have no answer to that question; it will have to remain a mystery. 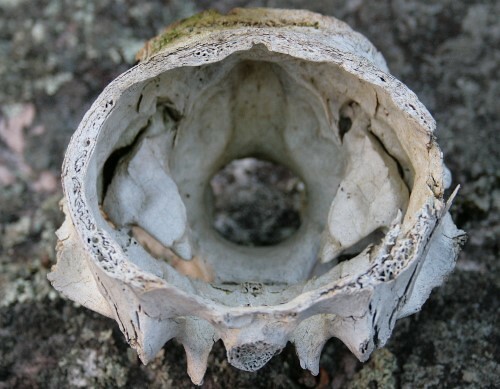 The sawed-off portion does present an interesting cross-section of the bone, however, something not typically seen when examining skulls or other bones. We’ve been taught that mammal bones are solid while bird bones are hollow, but neither of these are strictly true. Bird bones are actually filled with many struts that brace the two walls and give the bones strength. Mammal bones are filled with tiny holes and channels that give it a very porous look. In addition to making the bone lighter to carry around, these holes serve an important function: they are the channels that carry blood vessels through the bone network so they can access the marrow inside (the part of the bone which produces new blood cells). When puzzling over nature’s mysteries, I keep “human intervention” in my backmost pocket. Always a reluctant conclusion, but frequently the only resort. I’ll never forget my first gutpile. I’ve watched red squirrels carrying around bone, some for quite a distance. And I know many canids will pick up a bone and carry it,then tire of doing so. I agree, Julie. It’s easy to forget that there are other people out there who use the environment differently than we do. That must be what happened here, Kirk. It was a little big for squirrels, but we do have coyotes that hang about pretty close by.